I have a problem. If I see an interesting ingredient AND it's on some kind of promotion, I get filled with an increasing need to purchase said ingredient. This happened with a jar of Dulce de Leche on offer in my local supermarket. Keeping in mind that I live in Sweden, whose grocery prices are pretty lofty, and whose price saving promotions are few and far between in my humble opinion. Even when there are offers, the price saving is not usually that great. However! You mustn't look a gift horse in the mouth regardless of the size of the gift, so covet it I did. Well I coveted two. Crafty producers offered two variations: Baking, and Classic. How could I choose?! I decided that as I wanted to use it with cake, I would opt for the baking option. I went home, found a recipe, made it, was suitably disappointed, yada yada, more about that later. You would think that the purchase would satisfy my needs, if not dampen them. Well, no, it did not. I am all about possession, and as with Pokémon, I gotta catch them all! The price promotion was still on at least three weeks later! They were really tempting me. I managed to talk myself down from the ledge of hopelessness, and put the jar down. I didn't really need it. Turns out, I had already bought the Classic jar in some sort of Supermarket Sweep blackout. I really didn't know, and happened upon the sneaky pot nestled behind a box of cocoa. Kerazy. 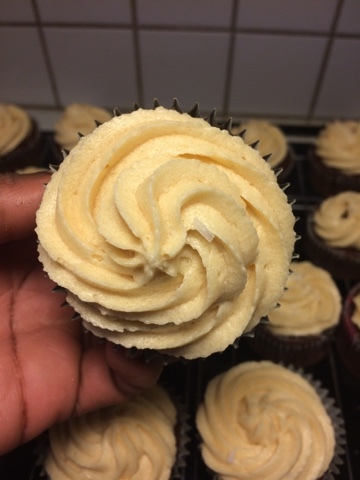 Anyhoo, so I was desperate to justify my initial purchase of the Baking Dulce de Leche so I scoured my usual suspects that I could search by ingredient with, and stumbled across a recipe for iced cupcakes. Huzzahs all around, everybody. It seemed fairly straightforward except for the coring, filling, de-coring (is that a word?) of the cupcakes. Fiddly, monotonous stuff that I really had no time for, but beggars cannot be choosers: I had selected this recipe based on the limited ingredients at home, so I plowed on. 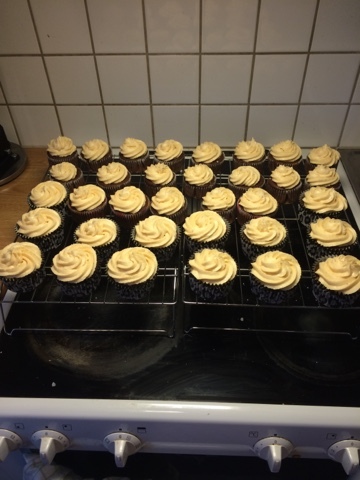 From memory, the cupcake mixture seemed nice and smooth, however proved to be heavy and close textured after baking. Big disappointment. Still edible nonetheless. Reflection: add equivalent of bicarbonate of soda to baking powder for extra lift. At the coring stage, I had a twinkling of a doubt that seeing as I was not baking the Dulce de Leche, I should have bought the other one, but I figured it wouldn't be much different. Kämpa kämpa. It turns out, I'm a mean corer; I could definitely have left more space for the gooey filling, but I retrospectively justified my actions by figuring that these were not results I could waste expensive ingredients on. The icing was a bit grainy, maybe because I used the wrong sugar, but I don't quite remember. 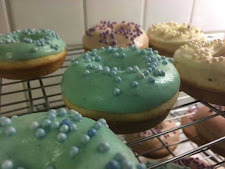 They were impressively uniform looking once they were frosted, so I surprised myself with my passable icing skills. Alas I did not think this through, so my transportation methods resulted in a few sad squashed fellows. Boo. I have since invested in a 24-cupcake carrier. It is certainly a beast, however somehow more comfortable to carry than my old case. Better luck next time... watch out for attempt 2!